The floods are back! The recent rain has produced the usual two pools though they're not properly joined up yet. However, the larger northern pool is now big enough to attract a reasonable gull roost so over the last few days I've been taking a look. In amongst the hoards of Black-headed Gulls there have been plenty of larger gulls to look through there's not been anything of particular note so far. On the duck front this evening there were about 230 Wigeon and 30+ Teal and waders have been represented by 30+ Lapwing and 3 Golden Plover. With the feral Greylags also enjoying the damper conditions and plenty of Linnets, Meadow Pipits and Pied Wagtails it's suddenly looking really "birdy" again! So all good stuff! The only fly in the ointment is that there is no rain forecast for the next week and even we don't get some decent follow-up rain fairly soon we're going to lose these floods again. 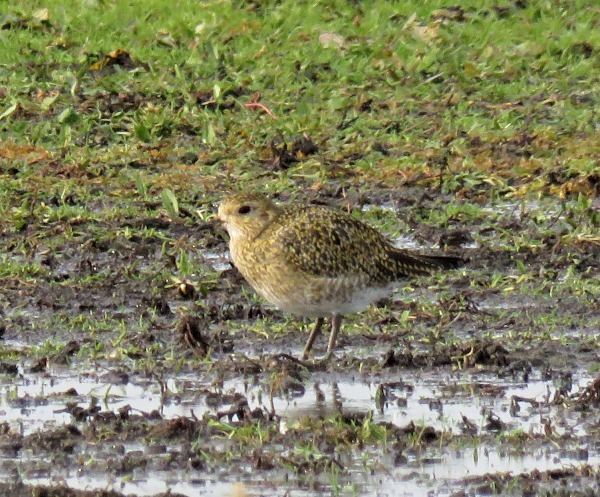 It's nice to see Golden Plover back on the Meadow. Over the last couple of years there haven't been the numbers that we used to get. Whilst Wytham Woods isn't strictly part of the patch, I'm going to give it a bit of a mention as it's not too far away from the Meadow. This weekend I was up there on Sunday afternoon en famille in order to enjoy the autumn colours. Whilst up on the ridge in the Hornbeam section I'm pretty sure I heard and briefly saw a Hawfinch. They have a distinctive "tic" call which first alerted me to it though it seemed to be moving through quite rapidly so it have been just passing through.